The Carlsbad Environmental Monitoring and Research Center (CEMRC) Internal Dosimetry (ID) laboratory has been performing free lung and whole body counting services for adult residents living within a 100-mile radius of the Waste Isolation Pilot Plant (WIPP) through a program entitled “Lie Down and Be Counted” (LDBC) since 1997. The purpose of the LDBC program was to establish a baseline of “normal” or “background” radiation present in adults living in the region of the WIPP prior to the emplacement of radioactive waste in the WIPP. Further, once disposal operations began at the WIPP, the LDBC program allows for the continued monitoring of public citizens to determine if WIPP-related disposal activities have any observable impact on area residents’ health. Between July 21, 1997 and March 26, 1999 (a period referred to as the “pre-operational” phase), the CEMRC ID lab had counted 366 public citizens thereby establishing a baseline from which future public measurements could be compared. Between March 27, 1999 and February 14, 2014 (a period referred to as the “operational” phase), the CEMRC ID lab had counted 991 public citizens. Comparisons of radiological activities measured between the pre-operational and operational groups revealed no significant differences; thereby indicating that waste disposal activities at the WIPP showed no measureable radiological impact on local residents’ health. Following the February 14, 2014 underground radiation event at the WIPP, the CEMRC ID lab counted 40 public citizens (between February 15, 2014 and June 30, 2014, a period referred to as the “event” phase), to determine if the radioactive contamination released from the repository could be detected in public citizen volunteers. The CEMRC ID lab is pleased to announce that none of the 40 public citizens counted after the February 14, 2014 event showed positive detections of Americium or Plutonium, the two main isotopes released during the underground event. Further, the detectable activities of other radioactive but non-WIPP-event-based isotopes were either similar to or below the activities measured in the pre-operational and operational phases. Therefore, it is the professional opinion of the scientific staff at the CEMRC ID lab that the February 14, 2014 underground radiation event at the WIPP did not pose any measureable negative health impacts on the local populace. 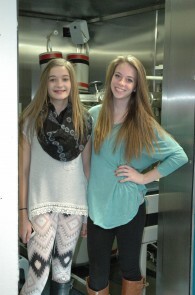 Audra Barney (left, age 14) and Raegan Hardy (right, age 15) pose for a picture following their lung and whole body count at the CEMRC ID lab. Additionally, shortly after the underground radiation event occurred, a number of concerned parents inquired whether the CEMRC ID lab could include children as part of the LDBC program – a request that received wide support from the U.S. Department of Energy, Carlsbad Field Office. Although the CEMRC ID lab was unable to accommodate this request immediately following the event, approval was received from the New Mexico State University (NMSU) Institutional Review Board (IRB) to allow the inclusion of minors into the LDBC program. Consequently, the CEMRC ID lab has recently performed several preliminary counts on children to ensure that the system is capable of detecting radiation in children below the age of 18. As a result of these efforts, the CEMRC is pleased to announce that children between the ages of 12 and 18, living within a 100-mile radius of the WIPP, are now included as part of the LDBC program and are eligible to receive free lung and whole body counting services. This entry was posted in Whole Body Count, WIPP event. Bookmark the permalink. Follow any comments here with the RSS feed for this post. Both comments and trackbacks are currently closed.